Below is a little bit of CatholicTV history combined with recent developments. CatholicTV, a once-small television station headquartered near Boston, Massachusetts, has recently expanded its reach and operations. CatholicTV began broadcasting over 50 years ago in the city of Boston. The original purpose of the television station was to air the Mass for people unable to leave their homes. Recently, changes have been rather dramatic. 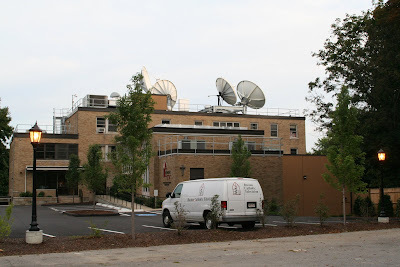 CatholicTV moved into a state-of-the-art multi-million-dollar facility in Watertown, Massachusetts. The current building was formerly a Dominican convent and now holds 3 fully digital television studios (2 were added to the original structure) with advanced cameras and lighting. CatholicTV broadcasts over 60 programs, over 40% of these are produced by CatholicTV. The station now broadcasts on major cable stations including Verizon FiOS, Comcast, and others. A national broadcast is made via Sky Angel IPTV. Viewers also watch at the company’s recently-launched website www.CatholicTV.com, which is one of the most sophisticated websites of any Catholic television station and was mentioned in the L.A. Times and Wall Street Journal Digital Network (2-17-09). CatholicTV is also preparing for a complete transition to high-definition with some of its programs already offered in HD. This April, CatholicTV will begin airing a series by Fr. Benedict Groeschel. CatholicTV already has programs featuring Archbishop Fulton Sheen, Cardinal Sean O’Malley, a children’s Catholic game show produced at CatholicTV, “This is the Day,” a live talk show featuring guests from as far away as Africa and Europe, a Christian rock show, Spanish Catholic programming, live, weekly Papal coverage from the Vatican, a Catholic travel show, and a cooking show in addition to the daily Mass, Rosary and other traditional shows. Although CatholicTV has recently undergone significant expansion, the company still operates with the intimacy and drive of a small business. The Director, Fr. Robert Reed is a priest of the Archdiocese of Boston. The General Manager, Jay Fadden, a Catholic husband and father of 3, first started working with CatholicTV as a free lancer 22 years ago. Mr. Fadden holds a Master of Arts in Ministry Degree from St. John’s Seminary. The CatholicTV team consists of only approximately 25 employees working to spread the Catholic faith.